İstanbul embraces two continents, one arm reaching out to Asia, the other to Europe. Through the city’s heart, the Bosphorus strait, courses the waters of the Black Sea, the Sea of Marmara and the Golden Horn. The former capital of three successive empires – Roman, Byzantine and Ottoman – today İstanbul honors and preserves the legacy of its past while looking forward to its modern future. Indeed, it is İstanbul’s variety that fascinates its visitors. The museums, churches, palaces, great mosques, bazaars and sights of natural beauty seem inexhaustible. As you recline on the shores of the Bosphorus at sunset, contemplating the red twilight reflected in the windows on the opposite shore, you understand, suddenly and profoundly, why so many centuries ago settlers chose to build on this remarkable site. At times such as these, you feel that İstanbul is truly one of the most glorious cities in the world. On a spot of land at the confluence of the Bosphorus, the Golden Horn and the Marmara Sea, stands Topkapi Palace, a maze of buildings at the center of the Ottoman Empire between the l5th and l9th centuries. In these opulent surroundings the sultans and their court lived and governed. A magnificent wooded garden fills the outer, or first, court. To the right of the second court, shaded by cypress and plane trees, stand the palace kitchens, now galleries exhibiting the imperial collections of crystal, silver and Chinese porcelain. To the left, the Harem, the secluded quarters of the wives, concubines and children of the sultan, charms visitors with echoes of a centuries old intrigue. Today, the third court holds the Hall of Audience, the Library of Ahmet III, an exhibition of imperial costumes worn by the sultans and their families, the famous jewels of the treasury and a priceless collection of miniatures from medieval manuscripts. In the center of this innermost sanctuary, the Pavilion of the Holy Mantle enshrines the relics of the Prophet Mohammed brought to İstanbul when the Ottomans assumed the caliphate of Islam. (Open every day except Tuesday.) 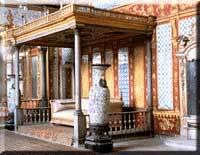 For more information on Topkapi Palace see homepage of Ministry of Culture. Facing St. Sophia stands the supremely elegant, six-minaret, imperial Sultanahmet Mosque. Built between 1609 and 1616 by the architect Mehmet, the building is more familiarly known as the Blue Mosque because its interior gleams with a magnificent paneling of blue and white Iznik tiles. During the summer months an evening light and sound show both entertain and inform. The cascading domes and four slender minarets of Süleymaniye Mosque dominate the skyline on the Golden Horn’s west bank. Considered the most beautiful of all imperial mosques in İstanbul, it was built between 1550 and 1557 by Sinan, the renowned architect of the Ottoman golden age. On the crest of a hill, the building is conspicuous by its great size, which the four minarets that rise from each corner of the courtyard emphasize. Inside, the mihrab (prayer niche) and the mimber (pulpit) are of finely carved white marble; fine stained glass windows color the incoming streams of light. It was in the gardens of this complex that Süleyman and his wife Hürrem Sultan, Roxelane, had their mausolea built, and near here also that Sinan built his own tomb. The mosque complex also includes four medrese, or theological schools, a school of medicine, a caravanserai, a Turkish bath, and a kitchen and hospice for the poor. Another skillful accomplishment of the architect Sinan, the Rüstem Pasa Mosque was built in 1561 on the orders of Rüstem Pasa, Grand Vizier and son-in-law of Süleyman the Magnificent. Exquisite Iznik tiles panel the small and superbly proportioned interior. The imperial Fatih Mosque, constructed between 1463 and 1470, bears the name of the Ottoman conqueror of İstanbul, Fatih Sultan Mehmet, and is the site of his mausoleum. Standing atop another of İstanbul’s hills, its vast size and great complex of religious buildings; medreses, hospices, baths, a hospital, a caravanserai and a library, make it well worth a visit. The great Mosque of Eyüp lies outside the city walls, near the Golden Horn, at the supposed place where Eyüp, the standard bearer of the Prophet Mohammed, died in the Islamic assault on Constantinople in 670 A.D. The first mosque built after the Ottoman conquest of the city, this greatly venerated shrine attracts many pilgrims. Built between 1597 and 1663, the Yeni (New) Mosque hovers over the harbor at Eminönü, greeting the incoming ferryboats and welcoming tourists to the old city. Today, its graceful domes and arches shelter hundreds of pigeons who make this area their home. Marvelous Iznik tiles decorate the sultan’s balcony. The l6th century Sokollu Mehmet Pasa Mosque built in an awkwardly shaped plot on a steeply sloping hill near Sultanahmet is one of the most beautiful examples of classical Turkish architecture and a masterpiece of the architect Sinan. Inside, breathtaking blues, greens, purples and reds color the elegant designs of the Iznik tiles. Walls of glass fill the four immense arches that support the central dome at the Mihrimah Sultan Mosque inside the Edirne gate of the old city walls. One hundred and sixty-one windows illuminate this mosque, built by Sinan for Mihrimah Sultana, the daughter of Süleyman the Magnificent in 1555. Also within the gardens are the Yildiz Palace, Theatre and the Historic Stage Costumes Museum, with its richly decorated scenery and stage, and its exquisite costumes. Rahmi Koç Industry Museum, in the suburb of Hasköy on the coast of the Golden Horn, an Ottoman-period iron- and steel-works building formerly called Lengerhane, it houses industrial development exhibits. (Open every day except Monday). The ancient Hippodrome, the scene of chariot races and the center of Byzantine civic life, stood in the open space in front of the Blue Mosque, an area now called Sultanahmet. Of the monuments which once decorated it, only three remain: the Obelisk of Theodosius, the bronze Serpentine Column and the Column of Constantine. Remains from the curved-end section of the Hippodrome’s wall can be seen on the southwest side of these three monuments. Today, the square forms the center of İstanbul’s historical, cultural and tourism activities. You should take particular note of the surrounding wooden houses, particularly the l8th century ones on Sogukçesme Street. Delightfully restored, they have new life as small hotels and one houses a fascinating library of books on İstanbul. The Ahmet III Fountain, built in 1729, stands at the entrance to Topkapi Palace. Deep overhanging eaves shade the water spouts where the parched could stop for a cup of refreshing water. This highly ornate, free-standing fountain is a superb example of the late Ottoman style. 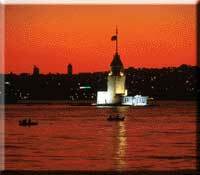 Mahmut II built the Beyazit Tower (85 meters high) in 1828 as a fire tower. Today it stands within the grounds of İstanbul University. The Bozdogan-Valens Aqueduct, built in 368 A.D., supplied the Byzantine and later the Ottoman palaces with water. Today part of the remaining 900 meters of double-tiered arches straddle the major highway that runs through the old part of town. The İstanbul land walls, once an impenetrable fortification, stretch seven kilometers from the Sea of Marmara to the Golden Horn. Restored recently, and many times previously, these walls date from the fifth century and the reign of Emperor Theodosius II. UNESCO has declared the land walls and the area which they enclose to be one of the cultural heritages of the world. The Galata Tower, a Genoese construction of 1348, rises 62 meters high over the Golden Horn. From the top, you see a marvelous panorama of the Golden Horn and the Bosphorus. In the evening, tourists enjoy its popular restaurant, nightclub and bar. Known as Leander’s Tower, Kiz Kulesi is one of the romantic symbols of İstanbul. First constructed in the l2th century on a tiny island at the entrance to İstanbul’s harbor, the present building dates from the l8th century. A stay in İstanbul is not complete without the traditional and unforgettable boat excursion up the Bosphorus, the winding strait that separates Europe and Asia. Its shores offer a delightful mixture of past and present, grand splendor and simple beauty. Modern hotels stand next to yali (shorefront wooden villas), marble palaces abut rustic stone fortresses, and elegant compounds neighbor small fishing villages. The best way to see the Bosphorus is to board one of the passenger boats that regularly zigzag along the shores. You embark in Eminönü and stop alternately on the Asian and European sides of the strait. The round-trip excursion, at a very reasonable cost, takes about six hours. If you wish a private voyage, you can contact one of the agencies which specialize in organizing day or night mini-cruises. During the journey, you pass in front of the magnificent Dolmabahçe Palace; farther along rise the green parks and imperial pavilions of Yildiz Palace. On the edge of this park, on the coast, stands Çiragan Palace ,now restored as a grand hotel. Refurbished in 1874 by Sultan Abdülaziz, it stretches for 300 meters along the Bosphorus shore, its ornate marble facades reflecting the swiftly moving water. In Ortaköy, the next stop, artists gather every Sunday to exhibit their works in a streetside gallery. The variety of people create a lively scene; sample a delicious bite from one of the street vendors. In Ortaköy, there is a church, mosque and a synagogue that have existed side by side for hundreds of years – a tribute to Turkish secularism and tolerance. Overshadowing İstanbul’s traditional architecture is the Bosphorus Bridge, one of the world’s largest suspension bridges linking Europe and Asia. The beautiful Beylerbeyi Palace lies just past the bridge on the Asian side. Behind the palace rises Çamlica Hill, the highest point of İstanbul. You can drive here to admire the magnificent panorama of İstanbul as well as the beautiful landscaped gardens. On the opposite shore, the wooden Ottoman villas of Arnavutköy contrast with the luxurious modern apartments of neighboring Bebek. A few kilometers farther out, facing each other across the straits like sentries guarding the city, stand the fortresses of Rumeli Hisari and Anadolu Hisari. The Göksu Palace, sometimes known as Küçüksu Palace graces the Asian shore, next to Anadolu Hisari. The second link between the two continents; the Fatih Sultan Mehmet Bridge straddles the waterway just past the two fortresses. From Duatepe Hill, on the European side, you can admire the magnificent panorama of the bridge and the Bosphorus. Below Duatepe, beautiful Emirgan Park bursts with color when the tulips bloom in spring. Opposite, on the Asian shore is Kanlica, a fishing village now a favored suburb for wealthy İstanbulites. Crowds gather in the restaurants and cafes along its shores to sample its famous yogurt. Shortly after Kanlica and Çubuklu is the Beykoz Korusu (Abraham Pasa Woods), a popular retreat. In the cafes and restaurants you can enjoy the delightful views and clear fresh air. On the European side, at Tarabya Bay, yachts seem to dance at their moorings. 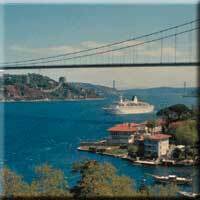 The coast road bustles with taverns and fish restaurants from Tarabya to the charming suburbs of Sariyer and Büyükdere. Sariyer has one of the largest fish markets in İstanbul and is also famous for its delicious varieties of milk puddings and börek (pastries). A little further on past Sariyer, the narrow strait widens and disappears into the Black Sea. This horn-shaped estuary, divides European İstanbul. One of the best natural harbors in the world, the Byzantine and Ottoman navies and commercial shipping interests were centered here. Today, lovely parks and promenades line the shores where the setting sun dyes the water a golden color. In Fener and Balat, neighbourhoods midway up the Golden Horn, whole streets of old wooden houses, churches, and synagogues date from Byzantine and Ottoman times. The Orthodox Patriarchy resides here at Fener. Eyüp, a little further up, reflects the Ottoman style of vermicular architecture. Cemeteries sprinkled with dark cypress trees cover the hillsides. Many pilgrims come to the tomb of Eyüp in the hope that their prayers will be granted. The Pierre Loti Cafe, atop the hill overlooking the shrine is a wonderful place to enjoy the tranquility of the view. Yachting is a popular activity in İstanbul. This is the only place in the world where you can enjoy the beauty of a mystical landscape while sailing back through history to Roman, Byzantine and Ottoman times, and view magnificent castles, palaces and mosques. From the North Sea through the European interior, yachters can sail down the European channel system and the Rhine and Danube Rivers into the Black Sea harbors and to the İstanbul-Bogazi and İstanbul marinas – a safe and short way to get there. Sail on the İstanbul Bogazi under the enormous bridges spanning two continents and around the Princes’ Islands to their beautiful bays. You may anchor and enjoy the serenity of this area. After enjoying all of the sights return to one of the two large marinas in the area. Ataköy Marina is on the European side and Kalamis Marina is on the Asian side. Both offer 24-hour service. International Offshore Yacht races are held in İstanbul every summer. The İstanbul region offers lovely opportunities for golfing enthusiasts: The Klassis Golf and Country Club, 65 km from İstanbul in Silivri, is the area’s second-largest golf club, with an 18-hole course and a 9-hole course. The Kemer Golf and Country Club,18 km from İstanbul in the Belgrad Forest near the town of Kemerburgaz, offers a formidable test of golf skill on its 9-hole course. The İstanbul Golf Club in the Ayazaga district of İstanbul has a 9-hole course. 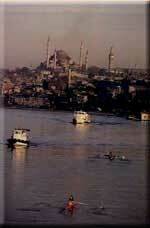 İstanbul is an international art and cultural center. The International Arts and Cultural Festival is held each year in June and July with famous artists coming from all over the world. These performances are held mostly in the Atatürk Cultural Center. Those enjoying classical music can hear it at Cemal Resit Rey Hall. Operas, operettas, ballets, film, concerts, exhibitions and conferences all share the cultural palette of the city. İstanbul also has a rich program of light entertainment. Nightclubs provide splendid entertainment throughout dinner, ranging from a selection of Turkish songs to the famous bellydance. İstanbul is an international gambling city with many casinos. Alongside these are modern discos, cabarets, and jazz clubs in the Taksim-Harbiye district. In Sultanahmet, there are a number of restaurants in restored Byzantine and Ottoman buildings which offer a unique setting for an evening out. Kumkapi, with its many taverns, bars and fish restaurants, is another attractive district. People have been meeting for years in Beyoglu district’s Çiçek Pasaji for snacks and seafood specialties. Also in this district, the narrow Nevizede street, near Çiçek Pasaji, is the best place in İstanbul for eating Turkish specialties and drinking raki. On the Bosphorus, Ortaköy is the best place for nightlife in İstanbul, with its nightclubs, jazz clubs, fine seafood restaurants and bars. In Eminönü ,don’t miss an opportunity to see the fishermen dressed in traditional Ottoman clothes on their Ottoman-style boats where you may board and taste their famous delicious fried fish. One could visit İstanbul for the shopping alone. The Kapali Çarsi, or Covered Bazaar, in the old city is the logical place to start. This labyrinth of streets and passages houses more than 4,000 shops. The names recall the days when each trade had its own quarter: Goldsmiths’ street, Carpet sellers’ street, Skullcap makers. Still the commercial center of the old city, the bazaar is the original shopping mall with something to suit every taste and pocket. Turkish crafts, the world-renowned carpets, brilliant handpainted ceramics, copper, brassware, and meerschaum pipes make charming souvenirs and gifts. The gold jewelry in brilliantly lit cases blinds passersby. Leather and suede goods of excellent quality make a relatively inexpensive purchase. The Old Bedesten, in the heart of the bazaar, offers a curious assortment of antiques. It is worth poking through the clutter of decades in the hope of finding a treasure. The Misir Çarsisi or Spice Bazaar, next to Yeni Mosque in Eminönü, transports you to fantasies of the mystical East. The enticing aromas of cinnamon, caraway, saffron, mint, thyme and every other conceivable herb and spice fill the air. Sultanahmet has become another shopping mecca in the old city. The İstanbul Sanatlari Çarsisi (Bazaar of İstanbul Arts) in the l8th century Mehmet Efendi Medresesi, and the nearby l6th century Caferaga Medrese, built by Sinan, offer a chance to see craftsmen at work and to purchase their wares. In the Arasta (old bazaar) of the Sultanahmet Mosque, a thriving shopping arcade makes shopping and sightseeing very convenient. The sophisticated shops of the Taksim-Nisantasi-Sisli districts contrast with the chaos of the bazaars. On Istiklal Avenue, Cumhuriyet Avenue and Rumeli Avenue, you can browse peacefully in the most fashionable shops that sell elegant fashions made from Turkey’s high quality textiles. Exquisite jewelry as well as finely designed handbags and shoes can also be found. The Ataköy Galleria Mall in Ataköy and Akmerkez Mall in Etiler have branches of İstanbul’s most elegant shops. Bahariye Avenue, Bagdat Avenue, and Capitol Mall on the Asian side, offer the same goods. In İstanbul’s busy flea markets you can find an astonishing assortment of goods, both old and new. Everyday offers a new opportunity to poke about the Sahaflar Çarsisi and Çinaralti in the Beyazit district. On Sundays, in a flea market between the Sahaflar and the Covered Bazaar, vendors uncover their wares on carts and blankets. The Horhor Çarsisi is a collection of shops that sell furniture of varying age and quality. The flea market in the Topkapi district, on Çukurcuma Sokak in Cihangir, on Büyük Hamam Sokak in Üsküdar, in the Kadiköy Çarsi Duragi area, and between Eminönü and Tahtakale, are open daily. After a Sunday drive up the Bosphorus, stop between Büyükdere and Sariyer to wander through another lively market. The Princes’ Islands, an archipelago of nine islands in the Sea of Marmara, were places of exile for Byzantine princes. Today, during the summer months, İstanbul’s wealthy, escape to their cool sea breezes, and elegant l9th century houses. Büyükada is the largest of the islands. Here you can enjoy a ride in a horse-drawn phaeton (carriage) among the pine trees, or relax on a beach in one of the numerous coves that ring the island. The other popular islands are Kinali, Sedef, Burgaz and Heybeliada. Regular ferry boats connect the islands with both the European and Asian shores. A faster sea bus service operates from Kabatas in the summer. On the European side of the Black Sea coast, 25 km from the outskirts of İstanbul, Kilyos’s long, broad sandy beaches draw crowds of İstanbul residents in the summer months. The Belgrad Forest, inland from the Black Sea on the European side, is the largest forest around İstanbul. On weekends, İstanbulites drive out to its shade for family picnics and barbecues. Seven ancient reservoirs and a number of natural springs refresh the air. The Ottoman aqueducts, of which the l6th Century Moglova Aqueduct built by Sinan is the most splendid, lend a majesty to the natural surroundings. Overshadowing the entrance to Kemer Golf and Country Club is the 800-meter-long Sultan Süleyman Aqueduct, also built by Sinan; it is one of the longest in Turkey. The 500-stable Equestrian Center offers trail riding. On the Asian side, Polonezköy, 25 km from İstanbul, was founded in the l9th century by Polish immigrants. İstanbul residents come to its pastoral landscape for walks, horseback riding and to enjoy the traditional Polish food served by descendants of the original settlers. On the Black Sea, 70 km from Üsküdar, Sile’s sandy beaches, fish restaurants and hotels make it one of the most delightful holiday places near İstanbul. Sile bezi, cool cotton clothing, popular with tourists, is fashioned here. The Bayramoglu-Darica Bird’s Paradise and Botanic Park, 38 km from İstanbul, is a unique rest area; many species of birds and plants from all over the world can be seen in this huge park, which also has restaurants and a promenade for pedestrians. The charming fishing town of Eskihisar, southeast of İstanbul, boasts a marina where yachtsmen can moor their boats after a day out in the Sea of Marmara. In town, the house of Osman Hamdi Bey, Turkey’s great l9th century painter, has been converted into a museum. Neighboring sites include the tomb of Hannibal between Eskihisar and Gebze, and a Byzantine castle. Many İstanbulites have summer homes near Silivri, the popular vacation area about 65 km from İstanbul. A large holiday resort, it offers everything from casinos to sporting, health and fitness facilities, including the Klassis Country and Golf Club, to excellent dining. The conference center attracts business people who escape the city’s fast pace for a working holiday. A regular sea bus service connects İstanbul to Silivri. A fast highway connects İstanbul with Izmit, the capital of the Kocaeli province. An important city in Roman times when it was known as Nicomedela, it is now a prosperous industrial center. The Saatçi Efendi Konak, a restored typical l8th century Ottoman mansion, now serves as the Ethnography Museum. Pismaniye, the local sweet, consists of thousands of thin layers of stretched sugar. Hereke, west of Izmit, is a major carpet making center. Renowned throughout the world for their beauty and quality, these carpets fetch the highest prices in İstanbul’s bazaars. On the Black Sea coast, north of Izmit, particularly at Kerpe, Kefken and Kovanagzi, sandy beaches and comfortable guest houses attract vacationers. East of Izmit, Sakarya is the provincial capital of Adapazari, an important agricultural and industrial region. The Sakarya (Sangarius) River irrigates this fertile land which abounds with fruit trees and fields of vegetables. In the city of Adapazari itself, the Atatürk and Ethnography Museum displays personal effects of the founder of the Turkish Republic as well as regional artifacts. The Besköprü Bridge, built by the Byzantine emperor Justinian in 553, stretches for 429 meters across the river. Eight arches connect the two shores. A few kilometers away at Lake Sapanca, quiet restaurants, hotels, and summer residences line the lakeshore. İstanbulites escape to this retreat in the Saman Mountain basin throughout the year. The Artifiye Forest on the highlands of Lake Sapanca has nice camping and picnic areas and an excellent panoramic view of the lake below. The Akgöl Lake lies just inland from the Black Sea Karasu holiday center; both places offer scenic surroundings. At Tarakli you can wander through a town that preserves many of its old buildings. The province of Bilecik lies southeast of Iznik in the verdant and fertile Sakarya River Valley. In the old quarter of the city stands the mausoleum of Seyh Edebali, who was an important influence in the founding of the Ottoman Empire. Every September, a commemorative ceremony and a culture festival are held here in his honor. The Orhan Gazi Mosque is near his tomb. Set amid the numerous willows which give Sögüt its name, a detour to this town is well worth the effort. The migrating Kayi Turks first settled here, and the tomb of their leader Ertugrul Gazi stands in the town. In September, a commemorative ceremony is held in his honor. Other tourist attractions include the life-size busts of famous figures from Turkish history and the Ethnography Museum which traces, through its displays, the history of Turkey. Seventeen kilometers west of Yalova, the relaxing resort area of Çinarcik has lovely beaches and modem holiday complexes. Helenapolis was the ancient name of Yalova which honored the memory of Emperor Constantine’s mother Helena who designed the entire city of Yalova. Today, Yalova is an important port city, famous for its thermal baths. Termal, in the southwestern part of the city is the thermal district center and the best place in Turkey to take the curative thermal bath waters. In Termal, there’s a wonderful panoramic view of the entire Termal district center from the top of a hill overlooking the city. The Atatürk Mansion, now a museum is located in Yalova, (open to the public weekdays except Monday and Thursday) . Built in 1929, Atatürk’s former summer residence displays original furnishings from the early 20th century. Formerly known as Nicaea, Iznik lies at the eastern tip of Lake Iznik, south of Izmit. Originally an important Roman and Byzantine town, it fell to the Seljuks in 1078 and subsequently to the Ottomans in 1331. Still a small town, it does not seem to have exceeded its original Roman walls. The four gates which allowed access to the city still stand. In the town center the ruins of the St. Sophia Cathedral, the seat of the first Ecumenical Council of 325, evoke images of convening bishops and clergy. In the l6th and 17th centuries, Iznik was the center of exquisite ceramic ware production which has made such an important decorative contribution to mosques and palaces throughout Turkey. A museum displays finds from nearby excavations. Among the important Islamic buildings in town, be sure to visit the turquoise tiled Yesil Mosque and the Nilüfer Hatun Imareti. After exploring the sights, the lakeside fish restaurants provide delicious food and a relaxing atmosphere. Yenisehir, on the road to Bursa, is filled with many interesting and lovely old Turkish houses. The l8th century Semaki Mansion, now restored as a museum, welcomes visitors. The city of Bursa, southeast of the Sea of Marmara, lies on the lower slopes of Uludag (Mt. Olympos of Mysia, 2,443 meters). The city derives its name from its founder Prusias, King of Bithynia. It subsequently came under Roman, then Byzantine rule before falling to Orhan Gazi in 1326 , becoming the first capital of the Ottoman Empire. Many important Ottoman buildings remain. Known as “Green Bursa”, the city is filled with gardens and parks and overlooks a verdant plain. It is at the centre of an important fruit growing region. Bursa was, and is still, famous for its silk trade, towel manufacture and thermal springs. You must taste locally invented Iskender Kebab, a dish of bread, tomato sauce, strips of grilled meat, melted butter and yogurt. Candied chestnuts are another regional specialty. A tour of the city begins in the eastern section at the Yesil Türbe (Green Mausoleum). Set in a garden and distinguished by its paneling of blue tiles, the mausoleum holds the tiled cenotaph of Sultan Mehmet I. Across the street, the Yesil Mosque of 1424 reflects the new Ottoman, as opposed to the Seljuk, aesthetic. A medrese nearby completes the complex, which is also home to the Ethnography Museum. Before exploring this area, stop for a glass of tea in one of the traditional tea houses. Uphill, to the east, you pass by the Emir Sultan Mosque in its delightful setting, and after walking through a district of old houses you reach the Yildirim Beyazit Mosque (1391). Now make your way to Cumhuriyet Square (known locally as Heykel) and stroll along Atatürk Avenue to Koza Park where outdoor cafes are set among flowers and fountains. At the back of the park, a long building, the Koza Han (1490), houses the trade in silk cocoons. 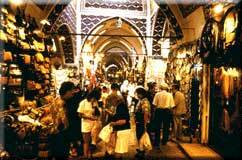 From here you proceed to the covered bazaar area, with its narrow streets, caravanserais and bedesten. On the other side of Koza Park stands the Orhan Gazi Mosque, built in 1413, and one of Bursa’s oldest religious buildings. Nearby, the large Ulu Mosque was constructed in the Seljuk style. A finely carved walnut mimber and impressive calligraphic panels decorate the mosque. 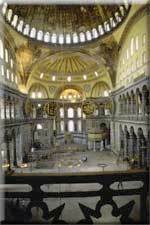 The sadirvan (ablutions fountain) lies amazingly within the mosque itself under the ceiling of twenty domes. 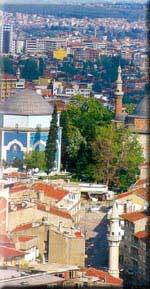 Walking west from Ulu Mosque you arrive at Hisar, an old and picturesque quarter of Bursa. In the park that overlooks the valley are the mausoleums of Osman, the founder of the Ottoman Empire, and his son Orhan Gazi, who commanded the army that conquered Bursa. The cafes of Tophane offer a good place to stop for refreshment. In nearby Ressamlar Sokak (Painters’ Street), local artists work in the open air. At the Yildiz Park, Tea Gardens in the Muradiye quarter, you get a superb view of the Muradiye Complex. The compound, in a tranquil park-like setting, contains the Mosque of Sultan Murat II (1426) built in the style of the Yesil Mosque and the tombs of Murat II, Cem and Sehzade Mustafa. These contain some of the loveliest decoration and tile work. The nearby Ottoman House Museum in a restored l7th century dwelling provides an interesting glimpse into the lives of wealthy Ottomans. A tour of the city begins in the eastern section at the Yesil Türbe (Green Mausoleum). Set in a garden and distinguished by its paneling of blue tiles, the mausoleum holds the tiled cenotaph of Sultan Mehmet I. Across the street, the Yesil Mosque of 1424 reflects the new Ottoman, as opposed to the Seljuk, aesthetic. A medrese nearby completes the complex, which is also home to the Ethnography Museum. Before exploring this area, stop for a glass of tea in one of the traditional tea houses. Uphill, to the east, you pass by the Emir Sultan Mosque in its delightful setting, and after walking through a district of old houses you reach the Yildirim Beyazit (1391). Other places of interest in Bursa include the Culture Park with the Bursa Archaeological Museum, and the Atatürk Museum on the road to Çekirge. The western suburb of Çekirge has been known since Roman times for its warm, mineral rich springs. Many modem hotels have thermal bath facilities and you can also visit the old hamams. Yeni Kaplica (New Spring) was built by Süleyman the Magnificent Grand Vizier, Rüstem Pasa, in 1552. The Eski Kaplica (Old Spring), built on the site of the original Byzantine baths, is the oldest bath. The Karamustafa Pasa baths are reputed to have the best hot mineral water in Bursa. Buildings of interest in Çekirge include the Mosque and Mausoleum of Murat I and the tomb of Süleyman Çelebi, a religious poet. The monument to Karagöz commemorates the character whose humorous antics are immortalized in Turkish shadow puppet theater. Uludag is the largest winter sports center in Turkey and offer s a variety of activities, accommodations and entertainment. 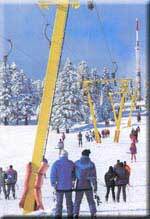 Thirty-six kilometers from Bursa, the slopes are easily reached by car or cable car (skylift). December to May is the best time for skiing, although the area, which is a national park, is well worth a visit at any time of the year, for the lovely views and wonderful fresh air. A seaside resort town 25 km from Bursa, Mudanya’s fine fish restaurants and nightclubs are popular with the residents of Bursa. The Armistice Museum is worth a visit. Just 12 km from Mudanya, Zeytinbagi (Tirilye) exemplifies the architecture and layout of a typical Turkish town. The Gulf of Gemlik, 29 km from Bursa has wide sandy beaches; Armutlu and Kumla are the favorites. The province of Balıkesir borders both the Marmara and Aegean regions. In the capital of Balıkesir, nature and interesting historical sites blend in harmony. The mid-l4th century Yildirim Mosque, built by Beyazit I, is the city’s oldest mosque. Of Zagnos Pasa Mosque, built in 1461 by Mehmet the Conqueror’s Grand Vizier Zagnos Pasa, and once part of a great complex, only the mosque and bath remain today. The Saat Kulesi (Clock Tower) built in 1827 by Mehmet Pasa imitates the Genoese Galata Tower on a smaller scale. The Karesi Bey Mausoleum of 1336 contains the cenotaphs of Karesi Bey and his five sons. Once known as ancient Erteka, Erdek is just 14 km northwest of Bandirma. One of the Sea of Marmara’s oldest and most famous resort areas, it offers pristine beaches and every type of accommodation. Marmara Island, formerly known as Prokonessos, rose to prominence in the Roman period and retained its importance in the Byzantine and Ottoman periods, because of its marble quarries, which supplied the luxurious stone for the extravagant imperial building programs. Near Saraylar village, Marble Beach derives its name from the natural marble that lies just off the water’s edge. In town, an open-air museum displays artifacts which date back to Roman and Byzantine times, and the marble quarry, where tourists can see every step of the quarrying process. Türkeli (Avsa) is another holiday island that boasts of spectacular beaches and clear water as well as famous vineyards and wine cellars. In the Manastir district stands the Byzantine Meryem Ana Monastery. 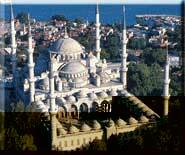 Fifty-five kilometers southwest of Bandirma, Gönen is Turkey’s most important thermal resort. The springs were used even in Roman times and a fifth century mosaic remains from what was originally a Roman bath. These waters come from 500 meters below the ground and emerge heated at approximately 82oC. Another 30 km to the northwest, Denizkent is a nice vacation spot with lovely beaches. Sindirgi lies at the base of the Alaçam Mountains amid beautiful forests and meadows in a region known for the weaving of superb Turkish carpets. The rugs of Yagcibedir are among the most prized in the country and grow more lovely the older they become. Around the Gulf of Edremit, also in Balıkesir province, are some of the most beautiful coastlines in the country where the clear waters meet sandy beaches encircled by the silvery green of olive groves. Ayvalik, Burhaniye, Ören, Edremit, Akçay and Altinoluk are all holiday towns which attract vacationers interested in a relaxing holiday , with beautiful scenery, and a wealth of historical and archaeological sites. The beautiful Değirmen Boğazı, an area ten kilometers from Balıkesir towards Bursa lies between two hills. Families flock to this scenic spot and its restaurants during weekends and holidays. At Karakol village , photographers can capture the three picturesque windmills on film. Ancient Penderamus, now called Bandirma, is today an important commercial and industrial harbor second only to İstanbul. You can spend a pleasant afternoon in the town’s restaurants and cafes. Belkis (Kyzikos) lies ten kilometers west of Bandirma. In this ancient city on the Kapidag Peninsula’s isthmus, the Temple of Hadrian, a theater and aqueducts still stand, captivating visitors. The Kus Cenneti National Park near Lake Manyas is an ornithological site where 239 different species of birds Nourish. Every year, over three million birds fly through this preserve. April and May are the best months to enjoy the wildlife. Thirteen kilometers southeast of Bandirma in Karacabey, horse farms breed magnificent specimens of this beloved animal. The city of Çanakkale lies at the narrow,1,200 meter entrance to the Çanakkale Strait that connects the Sea of Marmara and the Aegean whose shores touch both Europe and Asia. Passenger and car ferries run daily between Çanakkale on the Asian side; Eceabat and Kilitbahir on the European side. Yachts navigating the straits stop at the well-equipped Çanakkale Marina to allow tourists more time in the area. Hotels, restaurants and cafes along the promenade, offer a place to enjoy the comings and goings of the harbor, and view of the Kilitbahir Fortress and the Çanakkale Archaeological Museum. In 1451, Sultan Mehmet II, later the conqueror of İstanbul, built one fortress on the European side of the Çanakkale Strait at Kilitbahir and one on the opposite shore at Çimenlik to control the passage of ships through the strait. Today the Çimenlik fortress serves as a military museum dedicated to the Çanakkale Battle. Gelibolu Peninsula Historical National Park was established to honor the 500,000 soldiers who gave their lives on Gelibolu also known as Gallipoli. In 1915, Mustafa Kemal, commander of the Turkish army, led a successful campaign to drive out the allied powers from the area. The park includes memorials, monuments, cemeteries, the natural beauty of the Ariburnu Cliffs and Tuz Gölü (Salt Lake). The beauty of the green hills, sandy beaches and blue waters provides an honored resting place for the soldiers who bravely fought and died in this historic battle. You cannot help but sense the heart of the Turkish nation in the special spirit of this place. The largest of the Turkish islands, Gökçeada is ringed with pristine bays. 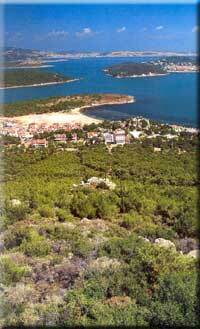 Its hills, covered in the contrasting greens of pines and olive trees are dotted with sacred springs and monasteries. Regularly scheduled ferry boats make the trip from Çanakkale and Kabatepe. In August, islanders and tourists gather for colorful local fairs. As you approach Bozcaada Island, the Venetian castle commands your attention. Then your eyes are drawn to the glistening white houses and the restaurants and cafes which line the promenade. Wine seems as plentiful as water on this island; a circuit reveals many vineyards and wine cellars. There are good sandy beaches at Ayazma, Poyraz and Igdelik. Homer immortalized Truva (Troy) in the stories of King Priamus, Hector, Paris and the beautiful Helen. Archaeological excavations have revealed nine separate periods of settlement and the ruins of city walls, house foundations, a temple and a theatre. A symbolic wooden Trojan horse commemorates the legendary war. The ancient harbor of Alexandria-Troas was built in the 3rd century B.C. St. Paul visited here twice, and on his third missionary journey, he continued from here to Assos. The acropolis of Assos (Behramkale) is 238 meters above sea level and the Temple of Athena was constructed on this site in the 6th century B.C. This Doric temple is being restored to its former glory and role as guardian of the Biga Peninsula and Edremit Gulf. Linger to see the moonlight scattered through the temple ruins, or rise early for the gentle awakening of dawn over the acropolis, from the top of which you can take in the magnificent vista of the Gulf of Edremit; and you will appreciate why this heavenly location was chosen. On the terraces descending to the sea are agoras, a gymnasium and a theatre. From the northern corner of the acropolis, you can see a mosque, a bridge and fortress, all built in the l4th century by the Ottoman Sultan Murat I. Below lies a tiny and idyllic ancient harbor. Assos has gained the reputation of being the center of the Turkish art community with its lively, friendly and bohemian atmosphere. This may be the holiday you will remember for years to come. 25 km west of Behramkale, in the village of Gülpinar is the ancient city of Chryse where the 2nd century B.C: temple of Apollon Smintheus is located. 15 km west of Gülpinar on an unmarked road along the jagged coastline lies Babakale, a scenic village of houses terraced on a cliff which drops to the sea. The town of Biga has lent its name to its entire peninsula. A town of parks, it is a good place to see houses built in a traditional style. The closest beaches are at Karabiga and Sahmelek, where you will find reasonably priced accommodations. Karabiga was known in ancient times as Priapos, after the god, and thus has cult and fertility associations. Çan is well known for its ceramics and sulphur springs, said to be helpful in various disorders of the liver, intestine and urinary tract. There are two other hot springs at nearby Külcüler and Kirazli. Kaz Dagi (Mt. Ida, 1774 meters) is situated at the southern tip of Çanakkale by the beautiful Kaz Dagi National Park with magnificent landscapes, peaceful green areas and several hot springs. At the northern entrance, via Bayramiç and Evciler, to the Kaz Dagi National Park are the main day-camping facilities. In Bayramiç, 60 km from Çanakkale is the beautiful 18th century Hadimogullari Mansion (Ottoman House) with its ethnography museum. On the opposite, northern shore of the Sea of Marmara, Tekirdağ is an important commercial harbor. From both sides of this modem city of lovely promenades, stretch beautiful sandy beaches. A happy mixture of sunflower fields and vineyards cover the surrounding area. The most important architectural monument is the Sinan-designed Rüstem Pasa Mosque, built by Süleyman the Magnificent’s Grand Vizier in 1554. The Archaeology and Ethnography Museum displays an extensive collection of artifacts from the area. The Rakoczy Museum occupies the house where the Hungarian prince, Rakoczy Ferench II (1676-1735), who fought for his people’s liberation, lived out the last years of his life. The Namik Kemal Memorial (1840-1888) honors the birthplace of the Turkish national poet. Sixty kilometers west of Tekirdağ, the holiday center of Sarköy ve Mürefte is a renowned winetasting region; beautiful vineyards cover the entire area, and the city hosts a wine festival every year. North of Tekirdağ on the border between Greece and Turkey, Edirne was for some years the Ottoman capital, and in the l8th century one of the seven largest cities in Europe. On a verdant plain of poplar trees near the junction of the Tunca and Meriç Rivers, this graceful historical city welcomes visitors as they make their way to İstanbul and other points east. The people of the Edirne area trace their origins beyond the rule of the Macedonians. The Roman emperor Hadrian rebuilt the city and renamed it Hadrianople after himself. With the division of the Roman Empire, the Byzantines claimed Edirne and in 1361, Sultan Murat I added it to his empire. Its position for almost 100 years as capital of the Ottoman Empire accounts for its many historically and architecturally important buildings. With its mosques, religious complexes, bridges, old bazaars, caravanserais and palaces, Edirne is a living museum. The Sinan Mosque is the city’s focal point. Occupying the top of a hill, Sinan’s design reflects the classical Ottoman style. Built on the orders of Sultan Selim II, (1569-1575) it attests to the technological abilities of the day and the genius of the Ottoman’s master architect. Built between 1403 and 1414 by Mehmet I, the Eski Mosque is · the oldest Ottoman structure in Edirne. The white marble of its portal contrasts with the building’s cut stone and brick masonry. Calligraphic inscriptions of Koranic verses decorate the interior. The Üç Serefeli Mosque, built between 1438 and 1447 by Murat I, presages the great period of Ottoman mosque architecture under Sinan and embodies both a new freedom from restraint and advances in engineering. The northwest minaret has three galleries, hence the mosque’s name, and was the highest minaret until those of the Selimiye Mosque eclipsed it. Towards the end of the l5th century, Beyazit II commissioned the architect Hayrettin to build him a complex in Edirne which includes a mosque, Darüssifa (hospital), medrese, kitchen and store rooms. The mosque is square in plan and covered with a deep dome; over 100 domes roof the remainder. The most important of the other buildings is the Darüssifa which stood out in its time as a modern hospital with a unique and humane architectural design. Little has changed in the Kaleiçi section of Edirne since the Middle Ages. Narrow streets lined with houses wind through the area. The number of small restaurants arid cafes reflect the district’s renaissance. Sinan built several of the famous baths in Edirne including the Sokollu, Tahtakale, Mezit Bey, Beylerbeyi and Gazi Mihal hamams. 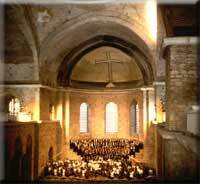 His work is also seen in the Ahmet Pasa Caravanserai and the Rüstem Pasa Caravanserai of 1561. The latter has been renovated and serves as a charming hotel. The old bedesten of the early l5th century still functions as Edirne’s main market. As you drive around the area you will notice many lovely Ottoman bridges gracing the Tunca and Meriç Rivers. Edirne has retained many of its colorful traditions and customs. 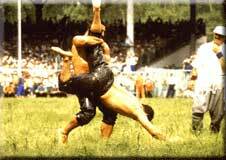 Every summer, where the Tunca River divides, an emerald green meadow is created, called Sarayiçi, where the Kirkpinar Greased Wrestling Contests are held. Shiny, slippery bodies grapple to determine who will emerge as champion. As you walk through the city and peer into the corners of the grocery stores, you see blocks of white feta cheese, a local specialty. Hardaliye, another of the city’s delicacies, is a grape drink mixed with mustard and marzipan. Scented soaps, earthenware pots and straw baskets from Edirne make good souvenirs. You will find it difficult to resist the beautiful embroidery work of the local women. The Archaeology and Ethnography Museum traces the history of the area from prehistoric to Byzantine times and exhibits clothing from the late Ottoman period. At the Turkish Islamic Art Museum examples of Ottoman architectural details, calligraphy, manuscripts, Korans, weapons, glass and an imperial tent used on military campaigns are displayed. On the way to the Saroz Gulf in the Aegean Sea, you can stop at Uzunkõprü to see an interesting bridge spanning the Ergene River, built by Murat II in 1444. Its 174 arches, the highest of which is 12.28 meters, make up its 1,354 meter length. The mild climate and beautiful surroundings on the Saroz Gulf invite holiday makers for a break of relaxation. On the northern point of the gulf are the lovely Ibrice and Erikli beaches. Here the hotel and guest-house facilities are plentiful and reasonably priced. Enez (Ainos) was an important port in ancient times, today it lies 3.5 km. inland. Its origins can be traced to the l2th century B.C. and was an important settlement during the Hellenic, Roman, Byzantine and Ottoman periods. Currently, it remains an open-air museum and was built by the Kyle people and was known as a colony of western Anatolian civilisation. Enez Castle has been restored several times throughout history and is well worth a visit. There is also a church dating from the 6th century B.C., some carved tombs and a beach with clear water. The people here are quite hospitable and Enez makes an interesting stopover. The Yildiz (Istranca) Mountains divide the province of Kirklareli. Lush mountainous landscape dotted with quaint houses transport you to an idyllic and tranquil frame of mind. The city of Kirklareli’s oldest mosque, the Hizirbey Mosque, was built in 1383. The mosque complex includes a bazaar. Nearby stands a hamam also built under Hizir Bey’s patronage. The l4th century Kirklar Memorial with its impressive 18 columns stands on Kirklar Hill honoring the site where 40 soldiers lost their lives when the Ottomans conquered this area neighboring town of Babaeski also boasts a Sinan building in the Cedi Ali Pasa Mosque. Vize (Byzia), an important Byzantine center, houses the Küçük Ayasofya church and a castle, both dating from the Byzantine period. under the command of Murat I. The Archaeological Museum exhibits finds from local excavations. Kirklareli’s Black Sea Coast is another place to enjoy beaches and good fish restaurants. Igneada, 98 km east of Kirklareli, lies squeezed between its sandy shores and the Yildiz Mountains. Kiyiköy (Midye) is another holiday resort town with good accommodations and picturesque dwellings from the Middle Ages; the town and its land walls date from the Byzantine period. The Sokollu Mosque in Lüleburgaz, on the Edirne-İstanbul road, is an exquisite work of Sinan’s that dates from 1570. The If you are travelling north to Bulgaria, linger for a few hours in the peaceful and green town of Dereköy, the last stop before the border.